Now we’re in a position to answer the question that we posed previously: given nominal GDP for the U.S. economy from 1960-2010, how much did real GDP actually increase? In order to see how much production has actually increased, we need to extract the effects of higher prices on nominal GDP, so that what we’re left with is real GDP, the increase in the quantity of goods and services produced. This can be easily done using a concept known as the GDP deflator. The GDP deflator is a price index measuring the average price of all goods and services included in the economy. We will explore price indices in detail and how they are computed when we learn more about inflation, but this definition will do for now. The data for the GDP deflator are given in Table 1 and shown graphically in Figure 1. Figure 1. 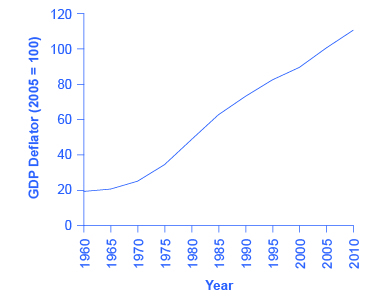 U.S. GDP Deflator, 1960–2010. Much like nominal GDP, the GDP deflator has risen exponentially from 1960 through 2010. (Source: BEA). Let’s practice finding real GDP by looking at the actual data on nominal GDP and the GDP deflator. Step 1. Look at Table 2 to see that, in 1960, nominal GDP was $543.3 billion and the price index (GDP deflator) was 19.0. Step 3. Use the same formula to calculate the real GDP in 1965. Step 4. Continue using this formula to calculate all of the real GDP values from 1960 through 2010. The calculations and the results are shown in Table 3. Comparing real GDP and nominal GDP for 2005, you see they are the same. This is no accident. It is because 2005 has been chosen as the “base year” in this example. Since the price index in the base year always has a value of 100 (by definition), nominal and real GDP are always the same in the base year. Look at the data for 2010. Use this data to make another observation: As long as inflation is positive, meaning prices increase on average from year to year, real GDP should be less than nominal GDP in any year after the base year. The reason for this should be clear: The value of nominal GDP is “inflated” by inflation. Similarly, as long as inflation is positive, real GDP should be greater than nominal GDP in any year before the base year. 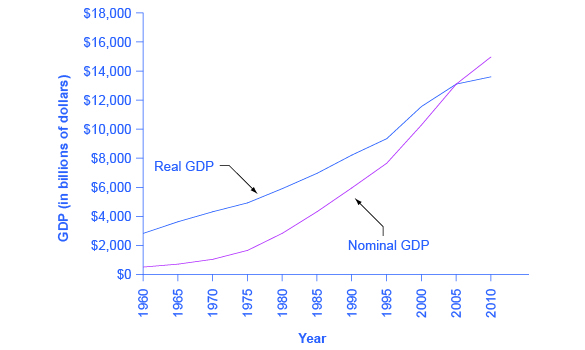 Figure 2 shows the U.S. nominal and real GDP since 1960. Because 2005 is the base year, the nominal and real values are exactly the same in that year. However, over time, the rise in nominal GDP looks much larger than the rise in real GDP (that is, the nominal GDP line rises more steeply than the real GDP line), because the rise in nominal GDP is exaggerated by the presence of inflation, especially in the 1970s. Figure 2. U.S. Nominal and Real GDP, 1960–2012. The red line measures U.S. GDP in nominal dollars. The black line measures U.S. GDP in real dollars, where all dollar values have been converted to 2005 dollars. Since real GDP is expressed in 2005 dollars, the two lines cross in 2005. However, real GDP will appear higher than nominal GDP in the years before 2005, because dollars were worth less in 2005 than in previous years. Conversely, real GDP will appear lower in the years after 2005, because dollars were worth more in 2005 than in later years. In other words, the U.S. economy has increased real production of goods and services by nearly a factor of four (i.e. 376%) since 1960. Of course, that understates the material improvement since it fails to capture improvements in the quality of products and the invention of new products. For short periods of time, there is a quicker way to answer this question approximately, using another math trick. Remember that nominal GDP increases for two reasons, first, because prices increase and second because real GDP increases. In other words the percentage increase in nominal GDP is (approximately) equal to the percentage increase in prices plus the percentage increase in real GDP. Therefore, the growth rate (percent change) of real GDP equals the growth rate in nominal GDP (% change in value) minus the growth rate in prices (% change in GDP Deflator). Note that Method 2 is only a quick approximation to Method 1.